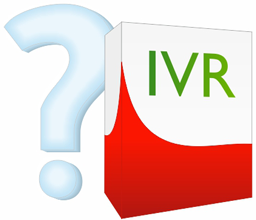 Home / What is IVR? Imagine having a group of people working around the clock answering calls, redirecting calls, contacting clients for feedback, sending out mass texts for any urgent organizational updates, taking messages and more telephony related tasks. Now think about not having to provide the space or pay nearly as much for those services and on top of it, a constant service (24/7). An Interactive Voice Response (IVR) service is that solution. Interactive Voice Response (IVR) is a technology that interacts with multiple callers through the phone network in order to obtain, alter or provide information, and redirect the caller to the desired receiver. The caller interacts with the IVR system through voice (voice recognition) or by pressing keys. IVR solutions are not limited to an auto attendant function (redirecting calls, providing preset responses, and more reception related work) but it can be used for a variety of other purposes such as disaster recovery, surveying, reminder systems, and status updates and checks. To a great extend, IVR solutions can replace most to all work done by people at a much lower cost with add-on benefits. Investments in Interactive Voice Response (IVR) applications have increased substantially in the past a few years, with companies large and small implementing a broad spectrum of applications designed to deliver higher efficiencies at a proportionate of cost. It is easily 200 to 300 per cent more expensive to have a live agent handle a call than an IVR. It typically costs $1 or less for an IVR interaction versus $5 to $7 for an agent.